To connect your high speed high precision instrument with the device under test, other instruments, sensors or test equipment a matching adapter cable is needed. Spectrum offers a wide number of adapter cables for different connector types. 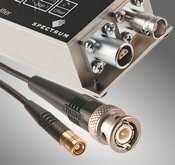 To acquire low voltage signals in the mV range with high speed digitizers there are several external pre-amplifiers available from Spectrum. These amplifiers offer switchable amplification of up to 60 dB and bandwidths of up to 2 GHz. As an addition to the existing arbitrary waveform generator products Spectrum is also offering matching amplifier cards that allows to generate higher output signals. These cards have a fixed amplification and are calibrated together with the arbitrary waveform generator. The clock and trigger distribution card is a simple and passive component that allows to synchronize several systems externally. An external clock and an external trigger event are synchronized on this card and then fed into a maximum of 17 independent systems. A system can be a digitizerNETBOX, a set of synchronized Spectrum products or a 3rd party instrument. The series of PCI docking stations enhance the application possibilities for the Spectrum boards. The system provides high performance for both static and mobile testing situations. The PCI hardware plugs into the external docking station, which in turn is connected via a Thunderbolt II/PC-Card/PCMCIA or ExpressCard interface to the notebook.